The early history of the formation of Orford Ness, and the construction of the river walls, both very significant in the development of any sort of a settlement at Orford, is unknown. Two documents predating the construction of the castle refer to a market and a causeway, so it seems that there was certainly a village of sorts in the early 12th century. 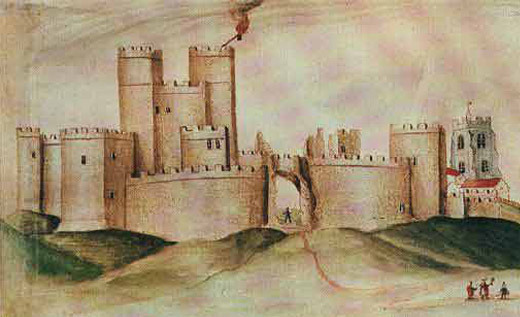 Orford’s fortunes changed dramatically when King Henry II chose Orford as the site on which to build a new castle. Work began in 1165 and was completed in 1173. St. Bartholomew’s Church was probably built at about the same time, as a ‘chapel’ to the existing parish church at Sudbourne. It occupies a commanding site in the centre of the village of Orford and, like the Castle, it is a landmark that has guided sailors into the safety of Orford for centuries. The nave and tower of the original church were rebuilt in 1320-40. The chancel of the earlier church became ruinous and was walled off in 1710 (although its remains may still be seen). The tower partially collapsed in 1830 and was not completely rebuilt until the 1972. The rest of the church underwent a thorough restoration between 1894 and 1901. Development of the town followed the castle. Trade increased and merchant guilds were formed during the Middle Ages. Orford’s market was held on Mondays with an annual fair on August 24th, St Bartholomew’s day. On July 7th 1579, in the reign of Queen Elizabeth I, the burgesses of Orford acquired a charter which incorporated the town as a free borough with a common seal and with power to hold property and to hold a court. The corporation consisted of a mayor, eight portmen (in most boroughs called aldermen), and twelve capital burgesses. The first mayor of Orford was James Coe who acquired property in Orford, including the lease on Chantry and Raydon Marshes. When he died in 1591 he left the leases, money and land in Castle Hill to the corporation to be used for charitable purposes. He also gave a silver gilt mace still owned by the New Orford Town Trust. 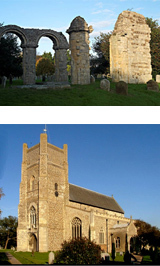 Orford first sent two representatives to Parliament in 1288. For the next 250 years it seems that sending MPs to Westminster was a bit sporadic, but from 1529 there is an unbroken list of MPs until the 1832 Reform Act. Orford castle was the property of the Kings of England for just over 150 years until 1336 when King Edward III sold it to Robert of Ufford, Earl of Suffolk and it remained in private hands until Sir Arthur Churchman bought it in 1928 and presented it to the nation. The Orford Town Trust became the custodian trustees of the castle and it was opened to the public in 1930. In 1962 the castle and the responsibility for its upkeep were transferred to the Ministry of Works, later the Department of the Environment and then English Heritage. The first office-holders under the 1579 charter were a group of men who had worked hard to raise the money needed to petition the Queen for the charter. The petition stated that the town was in a state of ruin and decay as economic conditions had undoubtedly worsened over the previous 50 or so years, due to the downturn in the fishing industry, continental wars disrupting trade, and piracy. Access to the river through the shifting shingle bar at the tip of Orford Ness became more difficult as boats increased in size. The corporation was responsible for the quay and for regulating the fisheries and oyster beds in the river and they took pains to keep outsiders away. Many boats were engaged in the coastal trade exporting wool and dairy produce and importing coal. Keeping the quay in repair was a constant preoccupation and great expense to the inhabitants until it was let on a repairing lease in 1743 and sold in 1813 to the Marquis of Hertford. It is now back in the ownership of the New Orford Town Trust. The quay along with the river and the river bed, which, unusually for a tidal river, are also owned by the Town Trust, are a source of revenue from mooring, fishing and landing charges to this day. The difficult trading conditions hinted at when Orford acquired its charter became a reality within 100 years. In 1673 Orford was described as “in former times a Town of good account for fishing, but that trade being lost, the Town cannot find itself”. The hearth tax returns of the following year record 5 empty properties, 20 households too poor to pay the tax and only 37 households able to pay. Daniel Defoe described Orford in 1722 as “once a good Town, but now decayed”.